Brexit might affect exports of some countries in the Asia-Pacific region disproportionately more than others. 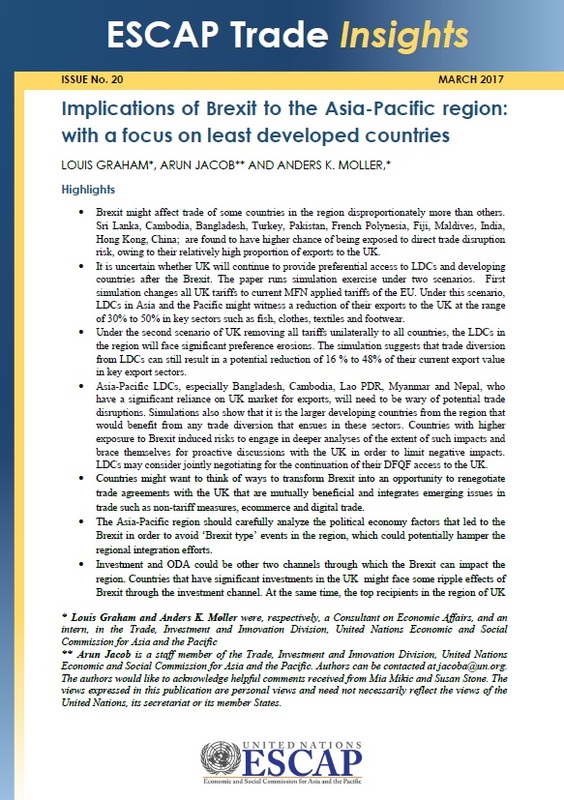 Simulation results, under different Brexit scenarios, show that the potential reduction in trade faced by least developed countries (LDCs) of the region can range from 16% to 50% of their current export value to the UK in key sectors such as as fish, clothes, textiles and footwear. Simulations also show that it is the larger developing countries from the region that would benefit from any trade diversion that ensues in these sectors. Countries with higher exposure to Brexit induced risks need to engage in deeper analyses of the extent of such impacts and brace themselves for proactive discussions with the UK in order to limit negative impacts.